Taipei, Aug. 17 (CNA) Taiwan's Ministry of Foreign Affairs (MOFA) described the disputed Diaoyutai Islands Friday as being "furtively occupied" by Japan, the first time it has used such a critical phrase in the territorial row. The term was used in a statement released Friday in which the ministry responded to Japan's release of Hong Kong activists who sailed to the islands and planted the national flags of Taiwan and China on one of them. The presence of the Republic of China (Taiwan) national flag on the Diaoyutais, part of Taiwan's territory that has been "furtively occupied" by Japan, is in conformity with the country's claim over the sovereignty of the islands, the ministry said in the statement. "The Republic of China's sovereignty over the Diaoyutais is based on history, geography and international law," the statement said in emphasizing the country's stance. The ministry countered concerns, however, that the activists' campaign implied that Taiwan was cooperating with China in pressing its case against Japan. "The government did not know (about the flag) beforehand and was not involved," the statement said. 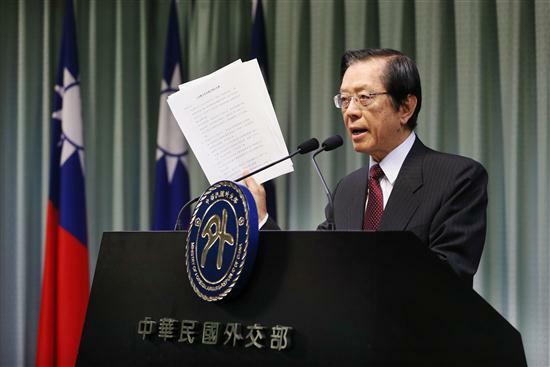 Senior foreign ministry officials have said on more than one occasion that Taiwan will not join hands with China in the Diaoyutai row. Despite the critical language, the statement praised Japan's release of the Hong Kong activists, saying it helped cool down escalating tensions. "The move not only helped lower regional tensions but also promoted regional peace and stability," the ministry said shortly after Japan decided to deport rather than continue to detain the 14 activists. To maintain regional security and prevent conflicts, Taiwan had been asking Japan to release the detainees since their arrest on Wednesday. China also lodged an official protest with Japan over the incident. Lying about 100 nautical miles northeast of Taiwan, the Diaoyutais is claimed by Taiwan, China and Japan.